My Morning Jacket’s twenty-five song set at McCaw Hall last month was sometimes epic, but at all times pretentious. Maybe it was the Opera House setting? Maybe it was the overly used synth backup vocals and drum machines? Maybe it was the thumbs up Jim James continued to give the crowd after every other song, Apostle of The Church of The Fonz? Where was this Legendary My Morning Jacket that I heard and read so much about? I may have missed the boat on seeing that MMJ. Everything was so overly produced, it was frustrating. The “Evening with My Morning Jacket” I got was the R.E.O. MMJ, The Eagles MMJ, the Yacht Rock (including a sax solo) MMJ. Added to this schmaltz, James draped himself in a cape whenever there wasn’t a guitar strapped to him, doing his best James Brown/Prince. Funny at first, but the joke got old. MMJ’s experimentation also pushed Wilco and Radiohead comparisons, but they just didn’t come close to either of those bands’ controlled chaos. Most of the 150 minute set was comprised of songs from Evil Urges. Half of this album makes my skin crawl, while the other half gives me goose bumps. The songs “Evil Urges” and “I’m Amazed” drew me in, and highlights from Its Still Moves and Z included “Gideon,” “Wordless Chorus,” “Off the Record,” and the closer “One Big Holiday”. These songs all stood out, but the band lost me on their smooth new songs, which came off forced and cheesy. Make no mistake, the MMJ product is there. The band is solid. Their albums are meticulously crafted, and the artwork is intriguing (the exception, once again; Evil Urges, pretentious). 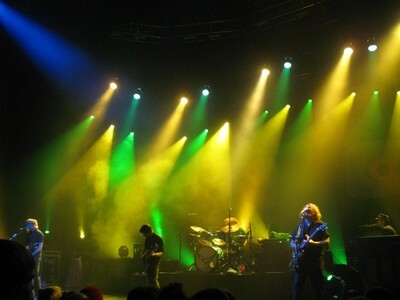 The band’s set and light show were perfectly produced. So maybe I shouldn’t complain, but I wanted to see the gritty My Morning Jacket I had heard so much about. Perhaps I waited too long to see them. Perhaps my expectations of seeing the “greatest live band, dude” were too high to be reconciled by a show that could’ve been a VH1 special. Whatever the case, it was a finely polished MMJ stage production that showed up at McCaw Hall. It was solid, well executed, but in the end, left me wanting.